Updated 05/31/17: You can now buy a fully unlocked Galaxy S8 and S8+ from Best Buy stores, BestBuy.com, and Samsung.com, as well as through carrier stores. If you haven’t yet read our extensive review of the Galaxy S8+, you should. Nearly everything said about that phone applies to the smaller Galaxy S8. It’s got the same gorgeous design, the same best-ever display, the same awesome camera, same processor, memory, storage, features...it’s just smaller. The display is 5.8 inches instead of 6.2, and the battery is 3,000 mAh instead of 3,500. These differences, and a price tag about $130 lower, are all the separate the Galaxy S8 from the S8+. That means the problems with the S8+ are apparent here as well, namely an unbelievably bad fingerprint sensor location and the lackluster debut of Samsung’s Bixby AI assistant. Both are annoying, but generally avoidable, and thus only slightly tarnish the Galaxy S8’s shine. The Galaxy S8 and S8+ are the first phones to hit the market with Qualcomm’s new 10nm Snapdragon 835 processor. The results are impressive. It delivers faster benchmarks than the Snapdragon 821, especially in multitasking and graphics performance. In many apps you won’t necessarily feel the difference, as we’ve reached the point where software optimization means more to how a high-end phone “feels” than processor performance. But it’s the energy efficiency that impresses me. 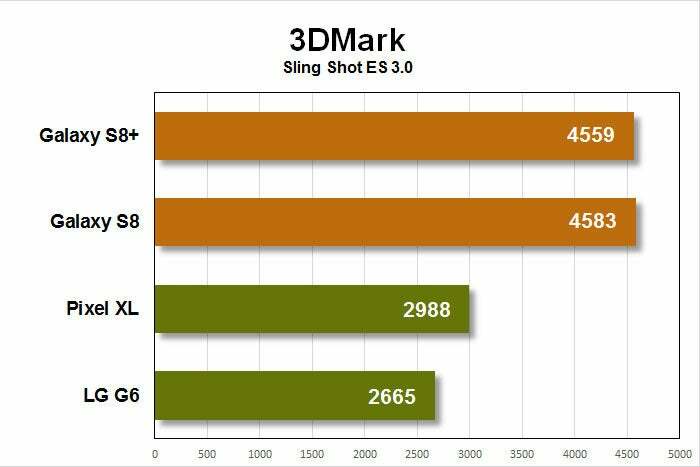 Particularly in 3D graphics tests, the new Snapdragon 835 outpaces the 821. The Galaxy S8 has a smaller display than the S8+, whose lower power requirements help to offset the roughly 17 percent smaller battery. I had no trouble getting through a full day of moderate-to-heavy usage, leaving Wi-Fi, cellular, and Bluetooth turned on, along with adaptive brightness and all the other sub-optimal settings that regular people use. The larger phone will probably last a little longer in real-world use, if only because the greater capacity will give it more standby “screen off” time. Our battery test, run with displays always on and fixed at 200 nits, showed both phones to have similar excellent battery life. 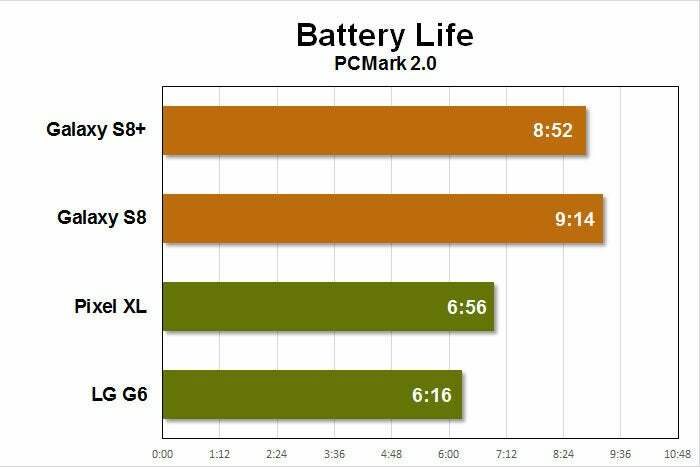 Battery life is better than you’d expect from a 3,000 mAh battery. The phone easily lasts all day. But great hardware is about more than just fast processor speeds and long battery life. It’s future-proofing features like support for gigabit wireless (carriers will roll it out over the coming year). It’s wireless fast charging, with support for both Qi and PMA standards. It’s USB-C and really fast wired charging—I went from zero to 73% in one hour with the included charger. It’s 64GB of storage standard, with support for microSD cards to expand it. It’s Bluetooth 5, which promises longer range, higher bandwidth, and faster connection times. 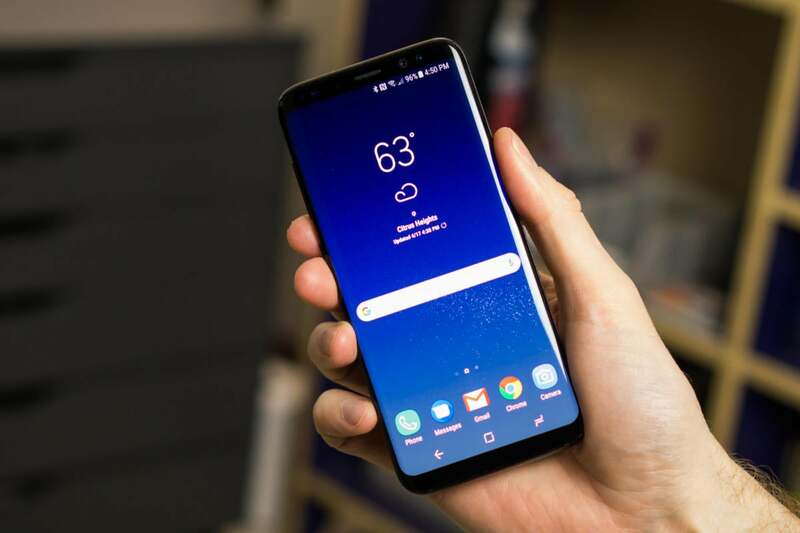 The Galaxy S8 is the first phone on the market to include it. 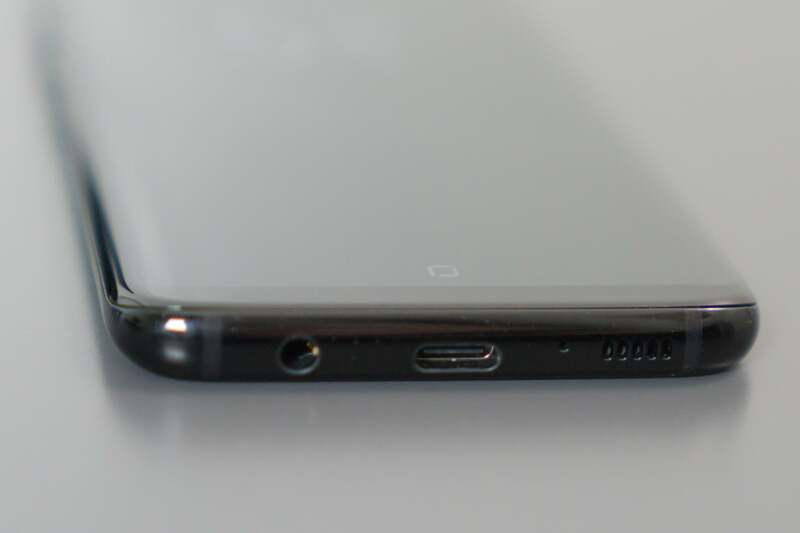 Samsung fit a ton of hardware into a tiny package, with almost no bezels, and waterpoofing, and didn’t remove the headphone jack. Take that, Apple. The IP68 waterproofing can be a lifesaver, and Samsung didn’t have to kill the headphone jack to provide it. The GS8’s speaker quality is only so-so, but the 32-bit DAC produces clean and detailed audio from the headphone jack. In fact, the Galaxy S8 and S8+ ship with a pair of AKG earbuds in the box that are far and away best pack-in earbuds I’ve ever used. Samsung says they’re worth $100, and from the excellent build quality (dig that braided cord) to the clear and punchy sound, I think that price is about right. They’re better than some $100 headphones I’ve used, but not the best in that price range. To get this quality included in the box is outrageously awesome and puts all other premium smartphone vendors on notice. 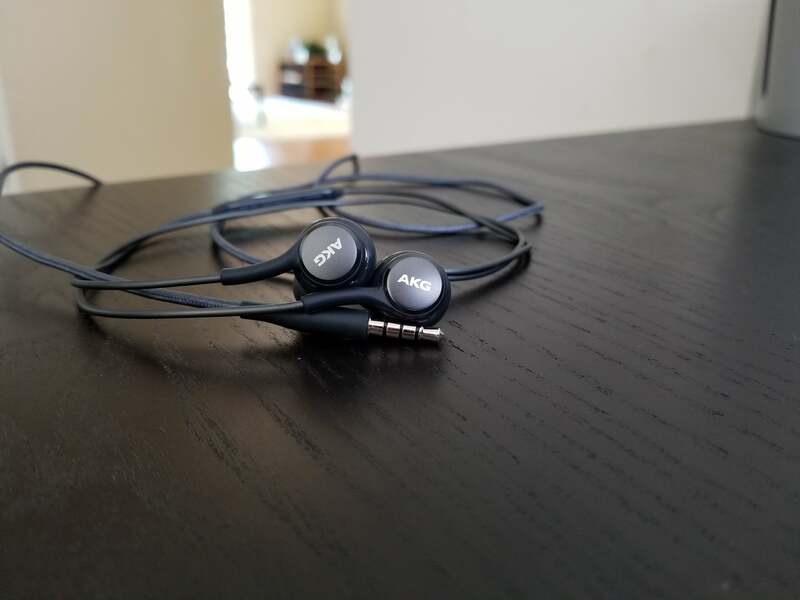 The AKG earbuds that come in the box are far superior to any other pack-ins I’ve ever used. Of course, the phone includes support for Samsung Pay, including the MST technology that lets it work with the older (and ubiquitous) swipe-style card readers. Samsung makes a lot of technology products that directly compete with Google’s, and most of them are not any better. I think Samsung Pay may be the exception. If there’s one major flaw with all the features packed into this gorgeous phone, it’s the placement of the fingerprint sensor. I can only assume there was some technical reason for it being shoved up to the side of the camera, because this placement wouldn’t have passed even the most rudimentary usability testing. Samsung did a great job of making the camera and fingerprint reader flush with the phone, but as a result you can barely ever tell them apart by feel alone. It’s hard to reach the sensor area, and just when you think you’ve got it, you find you’re pawing at the camera glass, leaving smudges all over it. The camera is flush with the body, as is the fingerprint sensor, so they’re nearly impossible to tell apart by feel. This is the kind of usability nightmare that would have instantly killed our ability to recommend the phone, if it didn’t also include an iris scanner that is impressively fast, reliable, and secure. 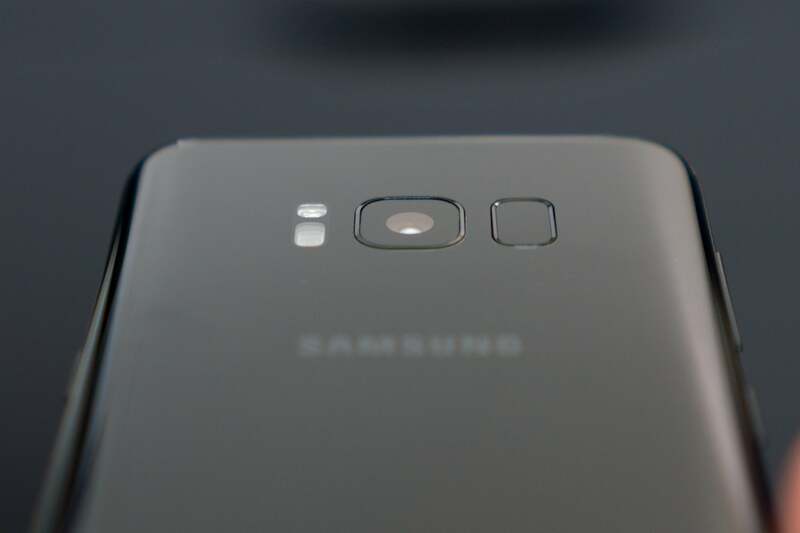 It’s improved a bit since its debut on the ill-fated Galaxy Note7, and while you do need to use your fingerprint for some apps, unlocking your phone and signing in to Samsung apps with your eyes is fast, secure, and reliable enough to greatly mitigate the disastrous fingerprint scanner placement. No phone is perfect, and the Galaxy S8 is no exception. But it's better than the best Samsung has ever made in almost every way.